Visit the gift shop at the Guinness Storehouse in Dublin and you’re likely to find all sorts of breweriana based on the great series of animal advertisements Guinness produced between 1934 and 1961. You’ve undoubtedly seen a lot of them: the toucan flying with two pints of Guinness on its beak, the ostrich with a pint glass stuck in its gullet. These are some of the greatest beer advertisements ever produced—but their creator remains little known. Anyone who loves the Guinness animal ads will enjoy Gilroy was Good for Guinness. The Scotsman’s unfair review did have one substantive point: John Gilroy was a comic genius. But as David Hughes’ book shows, Gilroy didn’t just dash off his work. His illustrations were the result of careful, patient effort. Gilroy began working for the S.H. Benson advertising agency in 1925. He started off doing drudgework until the agency’s top copywriter, Dorothy L. Sayers, recognized his talents as an illustrator. (Sayers, after leaving advertising for mystery novels, used her experiences with the Benson agency for her 1933 novel Murder Must Advertise.) Gilroy then had a retainer from Benson for the next 30 years and continued to produce occasional Guinness ads until 1964. Most of the book consists of reprints of illustrations done by Gilroy and other artists for the Benson agency, including rough sketches and finished advertisements that were never used. The archive mysteriously surfaced in 2009 after disappearing for nearly 40 years and was then quickly sold to a private collector, who allowed photos to be taken for this book. The balding, plump zookeeper with a bristly mustache in the ads is a self-portrait of Gilroy himself. Other trademarks of Gilroy art, according to Hughes, are a startled bird and a red polka dot handkerchief. See those elements in a Guinness ad and you’ll know that you are enjoying Gilroy’s artwork. The rough sketches reprinted in this book show how carefully Gilroy thought out his advertisements. He spent considerable time in the London Zoo sketching animals, making sure he was drawing them correctly. But occasionally Gilroy made mistakes. How could an ostrich swallow a Guinness glass—and have the glass be right side up in the gullet instead of upside down? Gilroy originally gave a convoluted answer, but ultimately Guinness gave them coupons for free beer, which made them happy. Because Guinness owned the advertisements Gilroy painted, he never earned royalties on them. But Guinness, which cut back on print advertising after commercial television was introduced to Britain in 1957, never forgot Gilroy. When he retired, Guinness gave him 2,000 pounds a year in his retirement to supplement his pension. In his final months of life, the brewery provided funds so that he wouldn’t have to die in a nursing home. 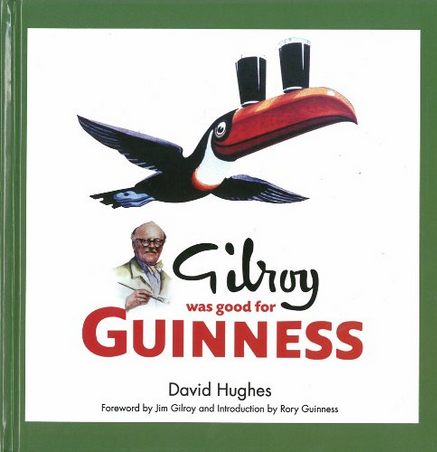 Even dedicated Guinness collectors will not have seen 90 percent of the illustrations in Gilroy was Good for Guinness (Liberties Press, Hardcover, $39.95, 288 pp), a handsome tribute to Gilroy’s genius.